On the Create tab, in the Forms group, click Multiple Items. 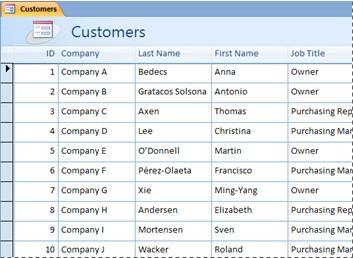 If Multiple Items is not available, click More Forms, and then click Multiple Items. Access creates the form and displays it in Layout view. In Layout view, you can make design changes to the form while it is displaying data. For example, you can adjust the size of the text boxes to fit the data. For more information about form views, see the article Which view should I use: Layout view or Design view?. On the Home tab, in the Views group, click View, and then click Form View.